This post has been a while coming. I have been on the island for 4 years now, and have come to realise the predicament that the non-car driver/owner faces when trying to get around the Isle of Man. The island has 8 or so towns/conurbations that are spread around the island connected by roads of varying quality, many running through the countryside along winding roads. The island has a government owned public transport system consisting of buses, steam trains, electric trams and even horse trams. Clearly, the bulk of mass transit of residents occurs on the buses, as the trams and trains are very much tourist-centric operations. Almost all residents, however, have a car and use them with most households having at least 2 cars. This has seen traffic grow significantly, resulting in expensive road improvement and expansion schemes. I am a keen supporter of public transport, after all, it is the most efficient means of getting people around while reducing the impact of carbon emmissions on the environment. Coming from Manchester, with its two major train stations, tram network and many bus services it was always easy to get around. On starting to find my way around the island, I knew it was going to be much more difficult. After all, who could reasonably expect the same level of integrated transport on an island the size of the Isle of Man? I don’t think, however, that the public transport infrastructure is as geared up and focused to the passenger as it perhaps could be. With most houses having 2 cars on the island (many of which drive up to 3 miles into Douglas), this should highlight that the public transport service is not meeting the needs of its existing or potential users. What seems clear, particularly with the Department of Transport’s recent acquisition of 11 new double deck buses is that the passenger is not necassarily the primary user, and therefore concern of the service provider. With its wealth of school services provided by the bus services (and rightly so), the biggest customer is the Department for Education. Therefore, 11 new buses may be justified as it cascades other buses down to these heavy use services. What is difficult to justify, however, are the town services that run around with 50/60 seats, most of which are empty. This ceases to be efficient use of money, fuel or staff. I believe that if you provide an efficient, reliable public transport service, people will use it – it has been proved the world over. So what’s wrong and how can things be improved? Bus services tend to have gaps of an hour or more between services. This is not helped by services not being around a clock-face timetable. Services depart from terminii at different times, making it difficult to plan for using public transport. (Service 3 from Ramsey: 06:50, 07:40, 08:00, 08:50, 09:10) I can’t wander down to a bus stop and wait for the next bus. I have no problem waiting 30 mins, but an hour or more if I have been unlucky enough not to fit within the bus timetable? More buses at better times that can be remembered are needed. A bus every 30 minuteson the hour or at a clock-faced timetable is a reasonable expectation, particularly on major routes. That way, even if the bus driver is early and I miss a bus (which has happened, resulting in a wait of 70 minutes), I only have to wait 30 minutes till the next. I am not asking for a high frequency service, just a reliable frequency service. Most vehicles are double decked, and are of relatively modern construction. There are a significantly smaller number of single deck vehicles for quieter periods and services. 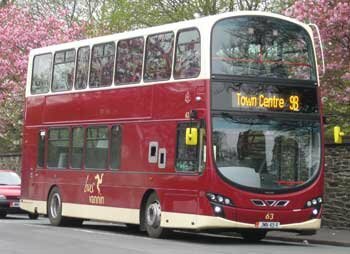 While double deck vehicles are ideal for school services and principle routes along the “commuter belt” (if one can call it that), they are less suited to town services. Town services provide the lifeblood to housing estates that are just a little too far for people to be able to walk, or even be prepared to walk. Again, the frequency and timing of “town services” is not logical. Instead, why not buy cheaper to buy, run and maintain vehicles – midi-size with up to 20/30 seats per vehicle? These would be ideal to zip in and around housing estates and into the various town centres, providing key accessibility for residents who do not have a car, cannot walk or feel they shouldn’t make such a small journey in their own vehicle (if such a person exists). A timetable may not even be needed for such small runs, allowing passengers to “turn up” at their local bus stop and expect a bus within 10 minutes or so. Such smaller vehicles would also be easier to manouvre around traffic calming measures on estates and difficult junctions, easing overall traffic flow. Services from the housing estates would also be better served if they went to Tesco, allowing parents and the elderly to be able to make a single journey, end-to-end. I tried getting on the bus to work from the Governor’s Hill Estate. This didn’t work out, but only because it didn’t save me any time in getting to work. the reason was that the bus started off at Governor’s Hill, then went into Birch Hill (therefore away from Douglas where it was heading), then around parts of Onchan, down onto the Promenade and to the bus stop at Lord Street. This seemed illogical to me. Why not have the bus travel from Governer’s Hill, maybe passing through Willaston Estate, Woodbourne Road (or the Promenade) and then to Lord Street? Why does the service have to go a long way out of its way before heading to its destination? A second service should start at Birch Hill and work through Onchan. Additionally, there is the bizarre situation where some locations on the island only get one service a day, going one way (for example, page 8, service 2 at 1155). What use it that? This seems to me just to be a way to meet public service requirements, rather than provide any common-sense of a service. I’ve talked about the frequency and lack of useful timing of the buses, but it is also worth considering extending the hours of operation of the buses. The first bus from Ramsey left at 06:50, which would get me into Douglas at about 07:45 (Glencrutchery Road). I’d end up being at work at 08:00. If you need to get in to Douglas earlier than 08:00, forget it. Equally, travelling home late at night. Buses stop before midnight (last bus to Ramsey is Service 2 at 22:50, one and a half hours after the previous service), so late-night revellers (who enjoyed extended opening hours before the UK) have to pay the exhorbitant prices charged by taxi services. Older buses used for school services, or again smaller, nippier vehicles, could be deployed at these times particularly at festivals such as the Laxey Blue Festival and TT. Why not use the Trams and Steam Trains? I realise the Manx Electric Railway and Steam Railway represents a significant cost to operate, but has any thought been put to extending the services to encourage commuters to use them when they need to, in addition to operating for tourists? Running a tram every 30 mins between 07:00 and 09:00 from Ramsey would surely contirbute to reducing the number of cars travelling over the mountain each day, which can be a dangerous drive both as a result of weather conditions and other drivers’ actions. Would it cost so much more and contribute so little? Being able to travel to/from Douglas relatively easily can only improve Ramsey’s chances of avoiding an almost inevitable demise as a living town. Equally, what about the Steam Train? It even has a halt at Ronaldsway for Airport users to use. Indeed, a colleague of mine used to use the Steam Train to do their Tesco Shopping from Castletown. 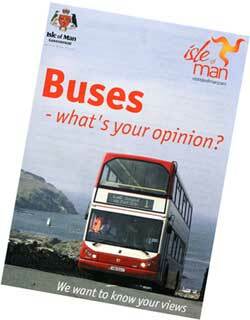 Funnily enough, we got a survey regarding the bus services through the door today. This is a great example of the Department of Transport wanting to be seen to be soliciting user views. Opening up the survey, however, gave a different impression. For instance, question 4 reads “How often do you make this car journey?”. Erm, I’m in my house. Question 5 continues, with “What was the main purpose of your journey today?” Well, to pick up the survey from the bottom of the stairs, actually. Question 6: “Please tell us why you made your journey by car today”. Clearly, this survey is ill targetted or ill-worded. First rule of market research is: target your questions correctly, otherwise your responses are worthless. All questions were closed questions and there was no provision to allow an open response, which I’d have quite enjoyed. (So I’m writing it here, instead). Brilliant idea in surveying users opinion, except that the users may not be users and those users would be thoroughly confused as to how to respond to the questions. Also, why send the survey out after spending £2 million on new buses? Surely the case should be used to justify the purchase, which had the right questions been asked, may have resulted in a better procurement being made – say of 20 (rather than 11) midi/mini-buses, operating more frequently? As in the UK, public transport investment often comes down to cold cash. This is wrong. The knock-on benefits of a bus service or a train service can be slow to be realised, but can be significant. While technologically light years away from where the Isle of Man is, the recent opening of High Speed 1 is already proving that public transport represents serious benefits to the economy, and with High Speed 2 already being planned these benefits can only grow to wider parts of the UK. This goes for the Isle of Man too. Providing services people can use and rely on is essential for a public transport service to be successful. To lure people away from their cars needs more than plush new buses, it needs common sense thinking within public transport as a first step – and then encouraging changing of behaviour as a second step, such as increasing the costs of car journeys, particularly those under 5 miles or on equivelant bus routes.